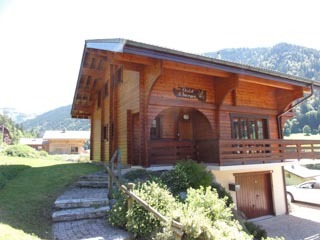 Chalet St Georges can comfortably accommodate 11 people in 5 bedrooms, close to Morzine centre. The accommodation is very spacious and spread over 3 floors. 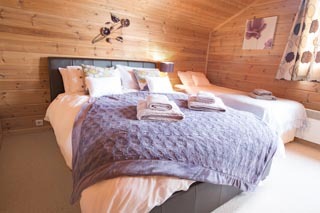 The chalet was updated to a very high standard recently with beautiful contemporary furnishings. And for winter 17-18 a brand new kitchen with all mod cons has been added! It is the perfect family home away from home. 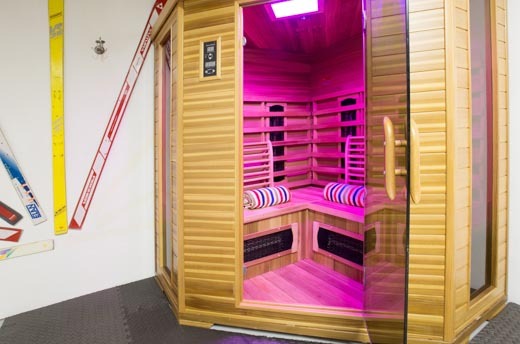 Following a busy day on the slopes you can ease any aching muscles in the new infrared sauna, the perfect wind down after a tough day on the slopes. Fully tested & certificated this is must for refreshing aching limbs so they’re ready for the next day. 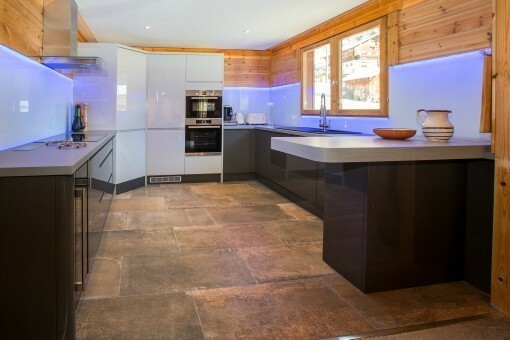 The first floor is a vast open plan space with a brand new fully equipped kitchen. As wel as the usual appliances you’ll find a walk in larder, double oven, wine fridge and a Tassimo coffee machine. There is a large dining area next to the kitchen space with cushioned seating for up to 12 people. The gorgeous bold designer sofas are arranged around a log burner, perfect for cosy evenings curled up with a book in front of the fire. Four sets of patio doors surround the whole area so you can appreciate the stunning views without having to leave the sofa! 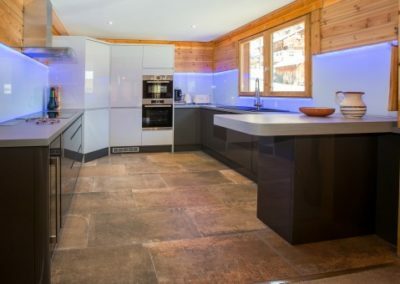 There is lots of natural sunlight, and a lovely terrace for spring apres-ski and summer meals – this is the place to enjoy a glass of wine as you watch the sun setting over the mountains. 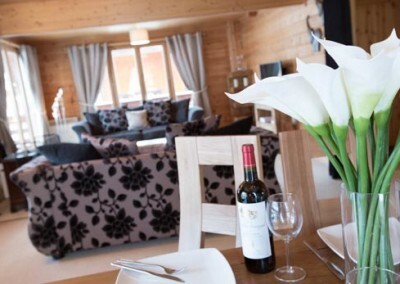 Chalet St Georges is on the sought-after sunny south side of Morzine, so you’ll get the best of the sunshine. The living area has a TV equipped with English and French channels, a docking station for music and WiFi internet access. There is also a large hallway and toilet. The basement houses a cinema room with 48 inch surround sound screen as well as a Playstation with games and a selection of films to keep everyone entertained. 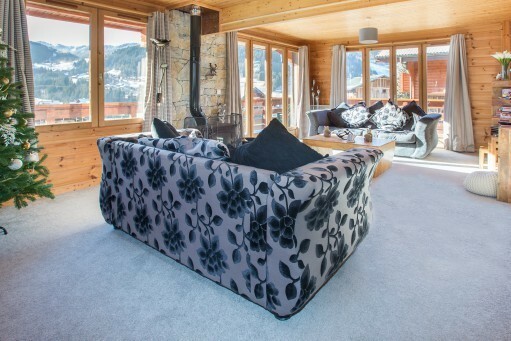 Relax on the comfy corner sofa in bright modern colours to watch a ski movie, beer in hand; or leave the kids entertained while grown ups sit back in peace in the first floor lounge! 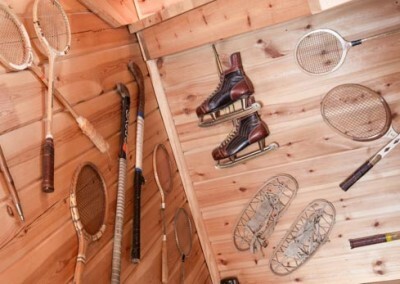 There is a large garage with plenty of room to store boots & skis and to hang up jackets and packs. There is also a laundry room with washing machine, tumble dryer and an overflow fridge freezer for any extra supplies. 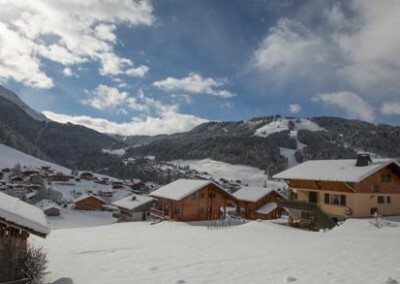 There is parking for up to 4 cars directly outside the chalet. On the top floor there are four bedrooms. 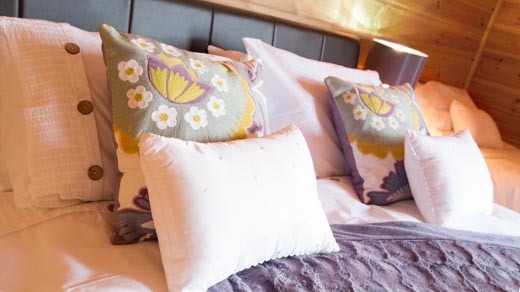 All bedrooms are equipped with fluffy duvets & pillows, large soft bath towels and each room has its own hairdryer. 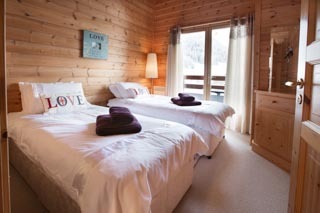 The three bedrooms at the front of the chalet open out onto a shared balcony with amazing views across the valley. The master bedroom has a king-size bed, an armchair and plenty of storage space, plus an ensuite bathroom with shower and separate toilet. The second bedroom has two single beds and generous storage space. 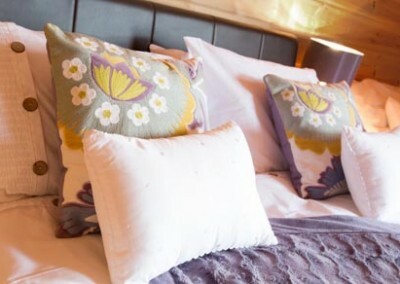 The third bedroom has a king-size bed & a single bed, plenty of storage space and an ensuite shower room. The 4th bedroom has two single beds and some storage. 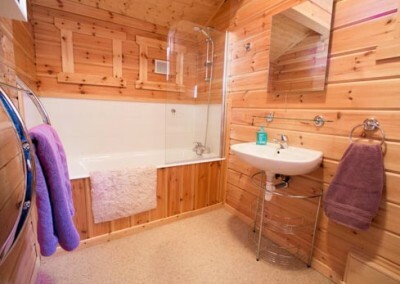 There is a large communal bathroom with shower and towel dryers, and a separate toilet. 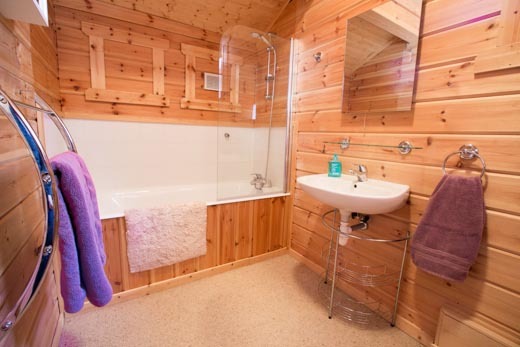 The fifth bedroom is located on the ground floor and has an adjacent shower room and separate toilet. Jo will meet and greet you when you arrive and is always on hand to help with any questions you have about Morzine or the chalet. 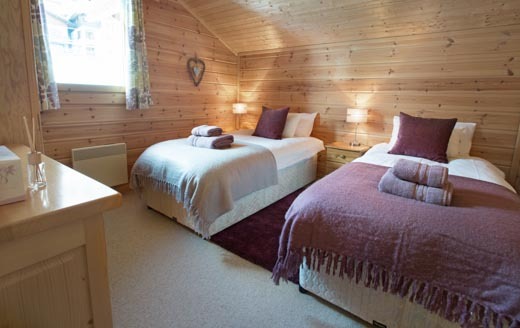 The chalet will be spotlessly clean for your arrival, and all beds made up. 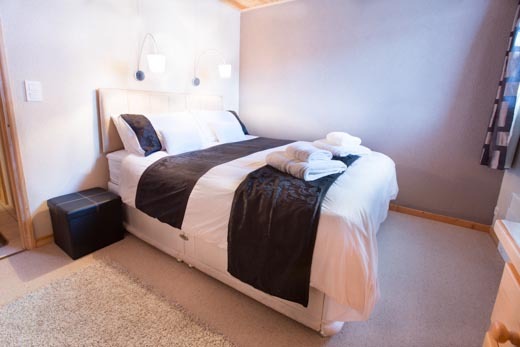 Second floor double bedroom with shared balcony and ensuite bathroom. Second Floor twin bedroom with shared balcony. Second Floor double bedroom with an additional single bed. It also has a shared balcony and an ensuite shower room. Ground Floor double bedroom with adjacent shower room & toilet. 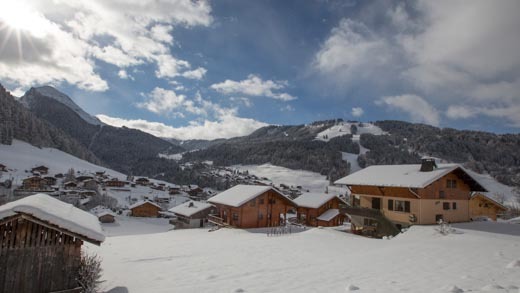 Chalet St George is perfectly situated just 8 minutes’ walk to the Super Morzine Telecabine and the village centre. 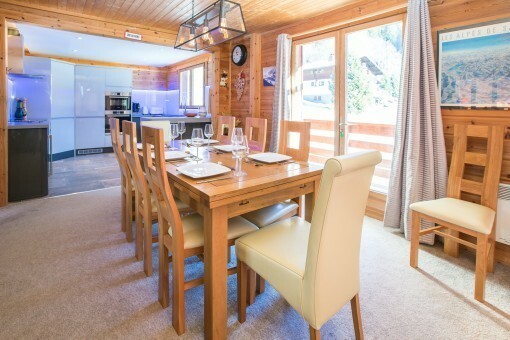 Located on the south side of Morzine the chalet is blessed with sun from mid-morning to late evening with fantastic views of the valley and Avoriaz in the distance. The free bus leaves every 30 minutes from the bus stop just 50 metres behind the chalet giving you easy access to all ski areas. 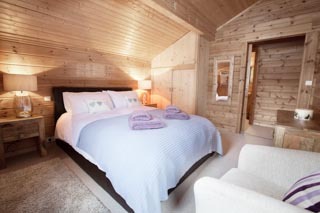 Please take a look at testimonials below from previous guests that have enjoyed staying at Chalet St Georges. 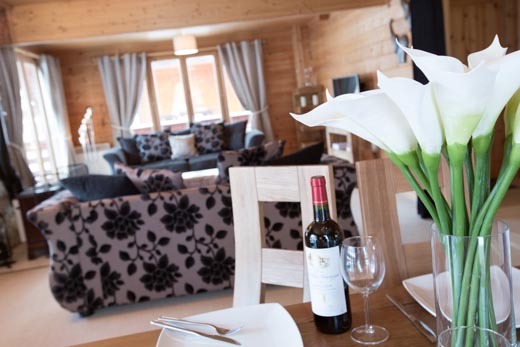 We have had 3 great weeks here with family and friends coming and going and all enjoying everything this lovely chalet provides. 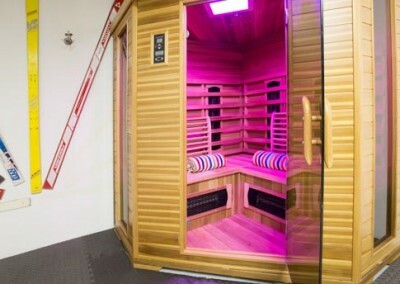 The location is perfect for getting to all the ski lifts and we have skied for miles and enjoyed a wide variety of weather condtions from hot and sunny to heavy snow. The chalet is thoughtfully equipped and furnished to make it a perfect base. Many thanks.